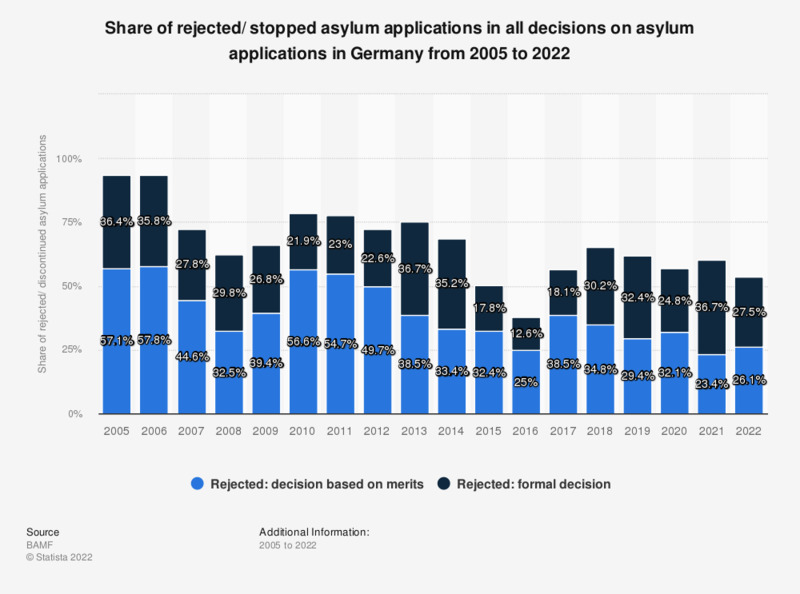 This statistic shows the share of rejected/ stopped asylum applications in Germany from 2005 to 2018. In 2018, 34.8 percent of all asylum applications were rejected in a decision based on merits. 30.2 percent of applications were rejected in a formal decision. The rate of rejection therefore amounts to 66 percent in total. * Figures displayed refer to rejections based on decisions of merit or formal decisions. According to the source, formal decisions are made without closer context inspection of the asylum claims (for example stopping the process due to withdrawal of the application by the asylum applicant or rejection of the application based on a further asylum procedure). Figures for years preceding 2008 were retrieved from "Bundesamt in Zahlen 2014", page 46. BAMF = Bundesamt für Migration und Flüchtlinge (Federal Office for Migration and Refugees). Everything On "Migration and integration in Germany" in One Document: Edited and Divided into Handy Chapters. Including Detailed References. Statistics on "Migration and integration in Germany"
Will the integration of refugees in the job market be successful? Do you believe that the majority of refugees can be integrated in the German job market? Will the integration of refugees succeed? Are you for or against a immigration law which will regulate the immigration of specialists from countries outside of the EU? In your opinion, is the Integration Act moving in the right or wrong direction? How important do you think the following integration tasks are in connection with the refugees coming to us? In your opinion, what should one do to be well integrated in Germany? How strongly do you feel that you belong in Turkey and how strongly in Germany? Which country feels like a home country to you, Turkey, Germany, both or neither? Would you accept asylum seekers with the following educational, religious and political backgrounds?